paths Archives - Bob Irsay Irrigation Design, Inc.
Landscape lighting in South Florida makes properties look distinguished. Spring represents a time to enjoy the outdoors. As the weather warms up, many people in South Florida start paying more attention to their lawns and landscapes than they had in the Winter. Some people turn their sprinklers on for the first time in weeks or months, only to discover that their sprinkler systems do not work. They try to get their sprinkler pumps to turn on, but cannot get them to fire up. For assistance with sprinkler pumps south florida, property managers and homeowners in places like Palm Beach County and Broward County can hire experienced and knowledgeable irrigation companies across the area. Depending upon the age and condition of the pump, an irrigation business in West Palm Beach or other area cities may recommend either repairing or replacing the pump. Many homeowners, businesses and property managers may want to make upgrades to their properties for Springtime. New landscaping such as flowers, shrubs and trees can improve a property’s appearance, as can low-voltage landscape lighting systems. Homeowners, communities and businesses like restaurants and retail stores can enhance their properties’ look with LED lighting systems installed by top landscape lighting south florida firms. New plants and landscaping give properties a fresh look – give this vegetation a better chance for surviving and thriving by making sure your property’s lawn sprinkler system operates and works properly. Schedule a service call to have a company go through the sprinkler system zone-by-zone, and ask the company to check the sprinkler coverage so that all green areas receive adequate watering. 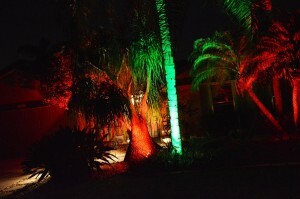 Consider installing a new LED lighting south florida system to make your property stand out. Hire an experienced LED lighting firm that can showcase your property’s plants and trees, as well as other features like waterfalls, paths and rock gardens. Tastefully installed lighting systems give properties a distinct look and highlight the pride property owners take in their yards and properties. This entry was posted in Blog, Landscape Lighting South Florida and tagged adequate watering, age and condition of the pump, better chance for surviving and thriving, Broward County, businesses, cannot get them to fire up, check the sprinkler coverage, communities, enhance their properties’ look, features, flowers, fresh look, give properties a distinct look, go through the sprinkler system, green areas, homeowners, improve a property’s appearance, irrigation business in West Palm Beach, irrigation companies, landscape lighting south florida, landscapes, lawn sprinkler system, lawns, LED lighting firm, LED lighting south florida, LED lighting systems, lighting systems, low-voltage landscape lighting systems, make upgrades to their properties, make your property stand out, new landscaping, operates, Palm Beach County, paths, property managers, repairing or replacing the pump, restaurants, retail stores, rock gardens, service call, showcase your property’s plants and trees, shrubs, Spring, Springtime, sprinkler pumps, sprinkler pumps south florida, sprinkler systems do not work, trees, turn their sprinklers on, waterfalls, weather warms up, works properly, zone-by-zone on 03/31/2016 by jason.